Injection molding is a kind of processing method used in batch production of some complicated parts. The working principle is that a material is heated to its melting point and then forced through an injection port to fill a formed cavity at high pressure. As the material cools, it will solidify into the shape of the cavity and become the desired part for further assembly. The mold consists of two parts, the moving mold and the fixed mold. The moving mold is installed on the movable plate of the injection molding machine and the fixed mold on the stationary plate of the injection molding machine. During injection molding, the moving mold and the fixed mold are closed to form the pouring system and the cavity. When the mold is opened, the moving mold and the fixed mold are separated to take out the products. Although the structure of the mold may vary greatly due to the variety and properties of materials, the shape and structure of final products, and the type of injection machine, the basic structure is the same. According to the structure, the mold is generally composed of die frame, die core, auxiliary parts, auxiliary system, dead angle treatment mechanism and other parts. If you are interested in Plastic Molding, you might want to have a look to our post about Adding Plastic Molding to your Project post! Generally, this is not a custom design and can be directly ordered from the standard die frame manufacturer. This greatly saves on the time needed to design the mold. In plastic injection molding, we call it the standard plastic mold frame. It forms the most basic frame part of the plastic mold. The kernel part is the core part of the mold, which is the most important part of the mold. The forming part of the final product is in the mold kernel and most of the processing time is spent on the mold kernel. However, there are some relatively simple molds that do not have the mold kernel part as the product can be directly formed on the template. Commonly used auxiliary parts of the mold include the locating ring, injector bushing, thimble pin, grasping pin, supporting column, ejector guide sleeve, garbage pin, and the other supporting parts. 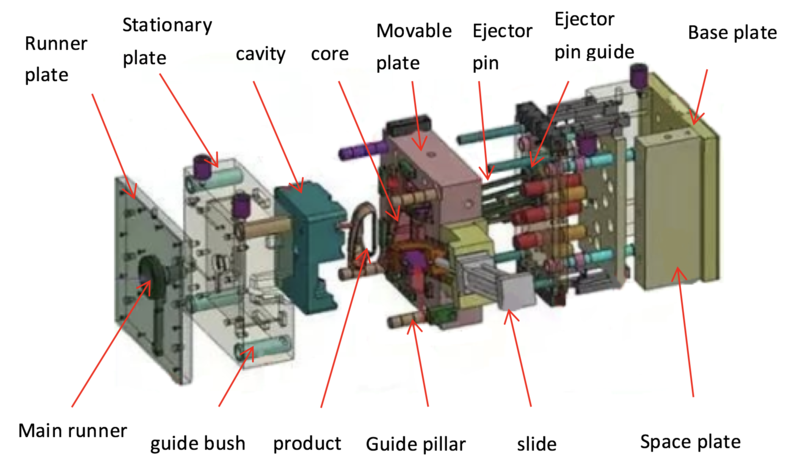 Some of them are standard parts that can be ordered together directly when ordering die frames and some of them need to be designed as a custom part. There are four auxiliary systems for plastic mold: casting system, ejection system, cooling system and exhaust system. Sometimes there is a heating system in some molds because the materials used must be heated at a very high temperature. When a product has a dead angle, the mold will also have one or more structures to deal with the dead angle. Some examples of these are a sliding block, inclined top, hydraulic cylinder, or other parts used to deal with severe angles. The simple fact is that the overall molding mechanism isn't too difficult for any particular type of molded product. It's pretty much some variation of the above system. The main differences come with the size of the mold and how it affects the locations of elements like the auxiliary parts, settings and overall system placement. Newer technologies have been introduced to help deal with situations like dead corners and some of the other plastics issues we've discussed in this blog. Designers have also become more experienced at dealing with their materials and the mold designs. The designs are very important to ensure longevity, simplicity of use, reasonable pricing, and, of course, good production. Experience counts! If you have a plastics project that could benefit from professional mechanical engineers with significant experience with these materials and molds, don't hesitate to contact us for a quote! We're always here to help.